Updated 1.29.2019 to include another great day in Chickaloon. "Are those the Northern Lights?" It was 6:30 AM, -6 degrees, and Meg and I were running hill sprints to start out the day. "Your legs are going to be barking!" A couple hours later I found myself pacing around my house. Where to ski? How much would it make my legs bark? I really didn't want to deal with my sled which is exactly why I wasn't making a decision. The impetus to move was a message from Tarah confirming the existence of the Chickaloon zone. I called Alex: "I'm running late, how about Chickaloon? Also, I still need to load up my sled, so its gonna be even later." Alex was running late too, so no problem. By the crack of noon we had passed more No Trespassing signs than I could count, found a parking spot devoid of ominous signs, and had fired up the sled. Having only a vague idea where to go, I gave Alex a brief how-to on tandem sledding and we followed a track into the woods ahead of us. A winding overgrown trail seemed to head generally in the right direction. 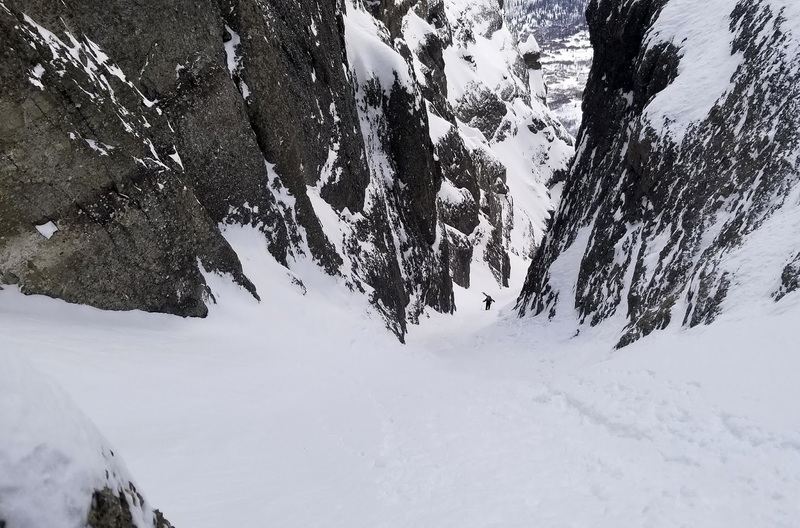 After an extended period of what Alex deemed "snowmachine singletrack", highlighted by a bloody eyebrow, we popped out under Castle Mountain and started skinning into the yawning mouth of the couloir. Rather surprisingly, about a half way to the top a group appeared above us. They provided an alarming warning about slashed tires, stolen spark plugs, and missing wheels, and we continued our our way. The topic of conversation changed to just how fast humans loose the value of sharing taught to us as children. But, deep within the silent walls of the couloir, with spindrift curling down above us, the beauty of the place reabsorbed us. Composed of granite, alaskite, gneiss, graywacke, and quartz, the Eska Conglomerate that makes up Castle Mountain is 3,000 feet thick and gorgeous. 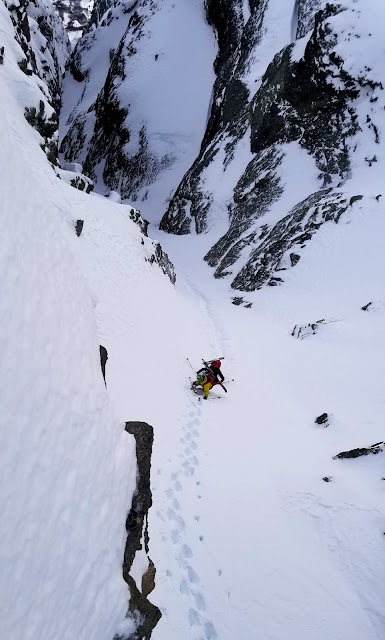 100 feet before the top, the spindift went from beautiful to dangerous, forming a nasty hard slab over weaker snow. Our skis moved from our backpacks to our feet and the quad burning descent began. Returning to the car, we were pleased to find it intact and arson free. Then the icing on the cake: deep in enemy territory, and completely blocking an icy one lane road; what came first, the trailer falling off the car, or the sled falling off the trailer? 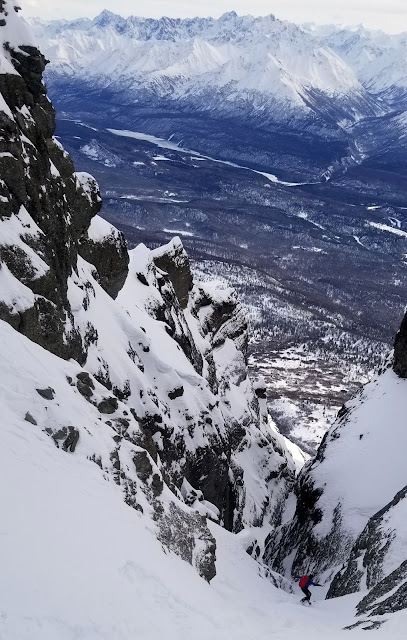 Nearing the top, the line tightened and we wallowed through four feet of soft snow. Buried in that snow there were two layers of intact surface hoar. Within the narrow walls of the couloir it was fine, but no one wanted to touch the toilet bowl entries of the other lines tucked into the face. One day we'll get out to Castle Mountain in soft and stable conditions, when that happens I can't wait to ski the other dramatic, but less stable lines on the massif.